Heart disease is a big concern because it’s one of the top killers in America. Fortunately, pomegranates are in season and can serve as a solid defense mechanism against the dangers of heart disease. Pomegranate juice can lower blood pressure, reduce cholesterol and lower the risk of heart disease. Pomegranate juice is antioxidant-rich and can improve heart health. The polyphenols, vitamins and minerals in pomegranate juice greatly outnumber those in other fruit juices. Pomegranate juice can help lower cholesterol, remove arterial deposits of “bad” LDL cholesterol, limit inflammation and encourage a more fluid cardiovascular environment that lowers blood pressure and the risk of heart disease. There have been a number of studies conducted over the ability of pomegranate juice to treat conditions related to heart health, blood pressure and cholesterol. These three things are very closely related, and all affect each other. For example, if you have high amounts of LDL cholesterol in your blood it is likely to accumulate on the walls of your arteries. This can harden arteries while limiting the amount of blood that’s able to pump through. The heart has to pump harder, which can increase the chances of heart disease or a heart attack. Pomegranate juice has been shown to lower blood pressure, which reduces the risk of heart disease. A small study from Queen Margaret University in Edinburgh, Scotland, found that drinking 500 ml (16 ounces) of pomegranate juice per day, for four weeks, significantly lowered blood pressure for 90% of the test group. It should be noted that the test group also exercised for 30 minutes each day, and blood pressure was measured before and after exercise. However, pomegranate juice seemed to enhance the positive effects on blood pressure. Another potential impact of pomegranate juice is that it may relax arterial walls, allowing more blood to pump through with greater ease. There have been similar results with polyphenol-rich foods such as coffee, dark chocolate and red wine. The more relaxed and elastic the arteries are, the easier blood passes through and the less intensive it is on the heart. Keeping your blood pressure in a healthy range can greatly increase your chances of avoiding heart disease. The ideal range is 120/80 or below, with prehypertension occurring when blood pressure moves higher. According to the Mayo Clinic, prehypertension occurs between 120-139 systolic blood pressure, and 80-89 diastolic blood pressure (the lower number). Hypertension occurs from 140/90 or above. Along with losing weight, a healthy diet and exercise, pomegranate juice might help complement a heart-healthy lifestyle. Another reason why pomegranate juice might be helpful in lowering blood pressure is the fact that it’s rich in electrolytes like sodium and potassium, which promote heart health. Low potassium is highly associated with high blood pressure and heart disease. As mentioned, the polyphenols in pomegranate juice can make it easier for blood to flow through your veins. The polyphenols, along with other vitamins and minerals, can also work to remove LDL cholesterol deposits inside your arteries. These deposits clog and harden your arteries and are a major contributor to high blood pressure and heart disease. A small study showed that people who drank about two ounces of pomegranate juice per day for one year decreased their blood pressure by 12%, while that number grew to 16% for those who did it for three years. The participants in the trial all had atherosclerosis, and saw their average diastolic blood pressure drop from 174 millimoles of hemoglobin (mmHg) to 153 mmHG. The subjects also noticed a rapid and substantial drop in something called lipid peroxidation, where free radicals bind to lipid membranes to create cell damage. The antioxidant capabilities of pomegranate juice limited this occurrence, which led to better lipid metabolism and less cellular damage. Pomegranate juice, like any fruit juice, can be unhealthy if there are a lot of added sugars. If you purchase store-bought pomegranate juice, make sure it’s natural, pure pomegranate juice with no added sugar. To remove the seeds: Cut the pomegranate crown off (the part with the stem) and then cut the pomegranate into four quarters. Take the pomegranate quarters and place them in a bowl of water. Gently roll the seeds out with your fingers. Once they’ve been separated, strain the water out and place the pomegranate seeds and blueberries in the juice extractor and blend. Living a heart-healthy lifestyle involves far more than drinking pomegranate juice, but it can potentially aid your efforts by adding some extra benefit. If you’re already exercising, eating right and doing the right things to keep your blood pressure at a healthy range, try including pomegranate juice in your diet for extra results. It tastes great and can help lower your blood pressure and reduce your risk of heart disease. Could This Juice Benefit Diabetes Patients? “Pomegranate Juice: Blood Pressure Fighter?” Huffington Post web site, last updated March 10, 2012; http://www.huffingtonpost.com/2012/10/02/pomegranate-juice-blood-pressure_n_1930680.html?ir=India&adsSiteOverride=in, last accessed November 23, 2015. Aviram, M., et al., “Pomegranate juice consumption inhibits serum angiotensin converting enzyme activity and reduces systolic blood pressure,” Atherosclerosis, 2001; doi: http://dx.doi.org/10.1016/S0021-9150 (01)00412-9. Murray, M. T., “3 Juice Recipes To Help You Enjoy Heart-Healthy Pomegranate,” Mind Body Green web site, February 3, 2014; http://www.mindbodygreen.com/0-12457/3-juice-recipes-to-help-you-enjoy-heart-healthy-pomegranate.html. Bauer, B. 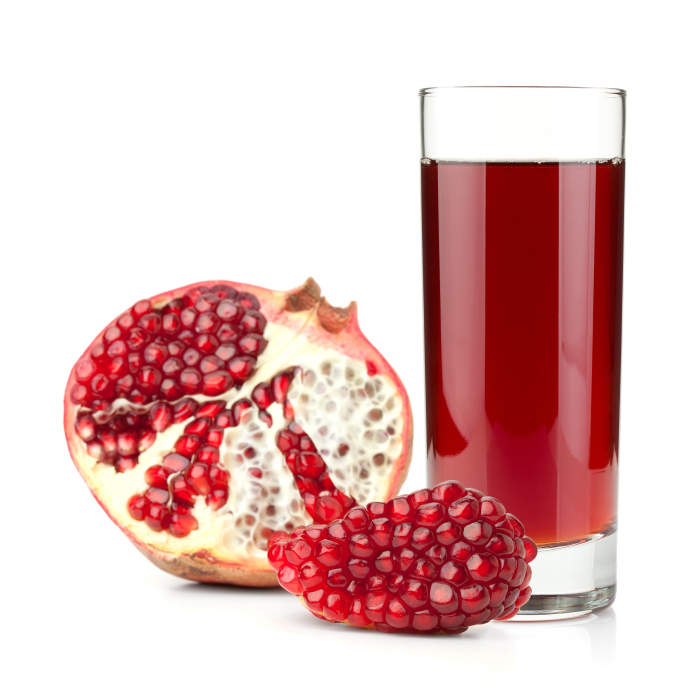 A., “Can drinking pomegranate juice help lower my cholesterol?” Mayo Clinic web site, November 27, 2014; http://www.mayoclinic.org/diseases-conditions/high-blood-cholesterol/expert-answers/pomegranate-juice/faq-20058560.